High-performance Teflon (PTFE) fiber material with its excellent high temperature stability, chemical stability, electrical insulation, non-adhesion, weather resistance, flame retardant, self-lubricating properties, has received a number of areas of national economy wide range of applications, as environmental protection, filtration, construction, aerospace and other areas of the preferred material. Because the nature of PTFE itself, resulting in the manufacture of PTFE fibers can not simply using the general method of forming thermoplastic polymer, and this technical bottleneck is our long-term production of PTFE fibers can not be an important reason, the project researchers independently developed film production of PTFE fibers split, that is, first prepared by three-dimensional drawing to meet certain conditions of expanded PTFE film, PTFE membrane will cut, and then through some stretching and heat treatment process, it made the required PTFE fibers. Currently there is only a few companies control the production of PTFE fiber technology, which has the main carrier of spinning production process and the paste extrusion, but these long-term blockade of China's implementation of technology and products are expensive and greatly increase the the application of the cost of PTFE fiber, PTFE fiber which has seriously hampered the development and application development. Only a little from the analysis of samples of foreign production began, a long hard years of exploration and hard work during this prelude. It is reported by the enterprises, research institutes and user research and design research group composed of the PTFE membrane fracturing the length of fiber production process, developed a non-constant temperature gradient control, variable width, repeatedly stretching PTFE fiber production process; developed a multi-angular-type membrane crack length fiber cutter, wear-resistant diamond cutting short fiber needle roller, dental floss and other films split key sections forming device design and processing of the screw extruder, two-roll calendar, non-constant pull stretching machine, gradient temperature change width tensile machine, cutting machine film split long fiber, short fiber cutting machine, fiber extrusion drafting machine, crimping machine series sets of production equipment, and established a large-scale production line, all The technology, products and production equipment at home and abroad reported in the literature no similar or identical, with the novelty and innovation. Check for new products further evidence that the production of PTFE fibers to fill the gap, PTFE fabric performance at the international leading level, PTFE fiber applications are in advanced international and domestic leading level. 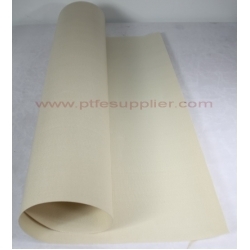 Experts believe that the project even invented the three-dimensional processing system PTFE membrane technology, independent research and development and integration of innovative PTFE membrane and fiber-specific sets of production equipment, stable, has formed a ton production capacity. This research has the independent intellectual property rights, patent applications 10, has authorized four, significant social and economic benefits, the market prospect is broad.